StarTracker Lite - Best StarGazing app to Explore the Universe is an iPhone and iPad app that will literally change the way you look at the night sky, providing you with an informational filter through which to gaze up at the stars. This app makes an awesome addition to the Education category of the App Store, where it can be downloaded completely free of charge. Let's take a look at its features. StarTracker Lite - Best StarGazing app to Explore the Universe downloads in a few moments, taking up just 23.8 MB of space on your iPhone or iPad. Simply fire up this app, give it camera access, and point the device to the night sky. This will give you a detailed look at the night sky, allowing you to find the Sun, Moon, planets of our solar system, and many constellations and stars. There is also information on the 12 zodiac constellations, helping you see the patterns, and six famous deep sky objects with graphics to help you visualize the universe. This app fully leverages iOS technology, from the camera to the compass. There is a 3D compass graphic integrated into the camera view, which will show you the positioning of the object you're looking at. The GPS is also integrated into this app, automatically detecting your location, or letting you manually set the location so you can see what the night sky looks like from anywhere on Earth. This is the "try before you buy" lite version of the app, which gives you a taste of the full version. You can upgrade to the full version for $2.99 once you've made up your mind. This will give you access to more objects, search functions, and a "time machine" option which lets you go back or forward in time and observe the night sky. A Night Mode "switch" is also included in the full version. 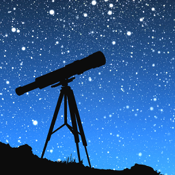 StarTracker Lite - Best StarGazing app to Explore the Universe is an app which is sure to evoke many epiphanies about the world and our place in the universe along with serving as an educational app for budding astronomers. Get this app on your iPhone or iPad if you're inclined or have a child who is inclined towards astronomy. Neha has been writing and editing since 2010 and has been reviewing iOS apps since early 2014. She has lived in four different countries and loves having the world at her fingertips thanks to these awesome apps.